For the record, Dr. Greg George did not climb Mount Everest. The headline of an online story posted on a Macon TV station’s website claimed the Middle Georgia State University professor did just that, but it was an understandable mistake. 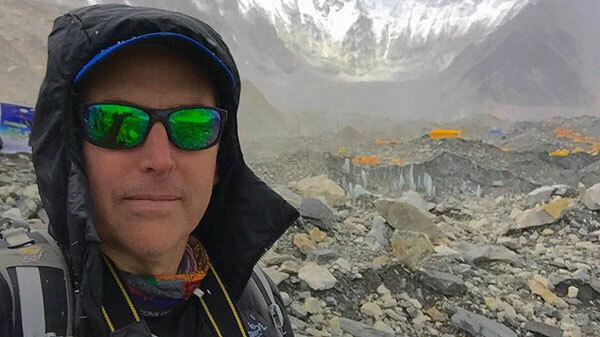 A newsroom staffer had spotted George’s blog chronicling his trek to Everest Base Camp and apparently assumed he was ascending Earth’s highest peak, located in a South Asian mountain range spanning Nepal and Tibet. as a walking pole, having shed 20 pounds from an already slender frame during the trip. His voice remains husky from high-altitude induced bronchitis, known among base camp trekkers as the Khumbu Cough, named after an area around Everest. The 48-year-old associate professor of Economics, who also directs MGA’s Center for Economic Analysis, is back to his summer classes - Principles of Microeconomics and International Economics - and mixing vignettes from his most recent journey into the course material. And yet, when members of George’s travel group unknowingly dropped cash on two different occasions, street vendors picked the money up and returned it each time. George joined the Middle Georgia State faculty in 2001 and was one of three School of Business professors who founded the Center for Economic Analysis, which provides applied research assistance to businesses, governments and civic organizations. Over time, George became a go-to guy for Macon area media outlets looking for expert commentary on topics ranging from unemployment rates to retirement savings to housing markets. In the last few years, George has also become known among MGA students and colleagues for his adventurous travel. A South Carolina native who spent formative years in Northern California, George has long been an avid backwoods hiker, snow skier, surfer and fly fisherman, but he began taking his escapades up a notch or two (or three or four) as he entered his mid-40s. Midlife crisis? “Definitely,” George said. His first turbocharged adventure came in late 2014 when he and a friend, Kimberly Holland, climbed and skied at Cayambe, a 19,000 foot volcano that is part of the Andes mountain range in Ecuador. “It’s the only place on the planet where you can ski on the Equator,” George said. The Ecuador trip was also the start of his adventure travel blog, Zero Latitude, where George describes his often-grueling undertakings, as well as observations of local places and people and musings on “geek” topics near and dear to him, such as geography, astronomy, photography, historical background of his destinations, gear-packing and ways to combat altitude sickness. His second climbing-and-skiing adventure came just a few months later when he tackled Tuckerman Ravine on the southeast face of Mount Washington in the White Mountains of New Hampshire. Tuckerman Ravine is a cirque (French, from the Latin word circus), defined by Wikipedia as a theater-like valley formed by glacial erosion. Base Camp. The term, as described in Wikipedia, refers to two base camps on opposite sides of Mount Everest. George trekked to South Base Camp in Nepal, which is at an altitude of more than 17,500 feet. North Base Camp in Tibet is at an altitude of 16,900 feet. Both camps are used by mountain climbers during their ascents and descents. The south side is the most popular with adventure tourists who don’t attempt climbs of the mountain itself but “only” trek to the base camp. Just getting to that point, however, is not for the faint of heart. George, again accompanied by Holland, took a flight to Kathmandu, then to Lukla, the gateway to Everest and home to what is considered the world’s most dangerous airport due to the steep terrain. From there, it was all on foot. Trekkers ascend to the Sherpa capital of Namche Bazaar then continue on for at least seven days to reach South Base Camp. George and Holland, who were grouped with other travelers led by the same local guides, took one route to the camp and an alternative trek back. They built rest days in to help acclimate to the high altitude, but Holland and some others in the group still were sickened. Four – not including Holland - had to be helicoptered out. George did not get altitude sickness but the trek was the most draining of his considerable travels. George thinks his travels make him a better teacher. He often encourages Middle Georgia State students to take advantage of study abroad opportunities and travel as much as they can while they are young and have fewer responsibilities. George is now contemplating where his next trip will take him. He hopes his 18-year-old son eventually joins him on one of his special excursions. But Percy George, while active and athletic, is at the moment more interested in computers than adventure travel. Wherever George ends up next will no doubt seem exotic to most mere mortals. But George admits the Everest trek was probably the apex of what he’s willing to do. Photo: Dr. Greg George during his recent Everest Base Camp trek.